Guilin West Railway Station, also shown as Guilin Xi Train Station (桂林西站) is a passenger railway station constructed in 2011 and opened in January of 2016. It is located in Dingjiang Town (定江镇), Lingchuan County (灵川县), Guilin City (桂林市). 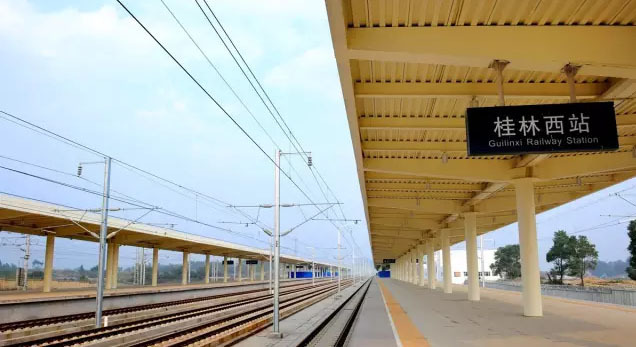 The station is maily handling the high speed train service (Via Guilin) running along the Guiyang – Guangzhou High Speed Railway, linking Guilin with Yangshuo Railway Station, Guiyang North in Guizhou Province and Guangzhou South in Guangdong Province, etc. Important note: Guilin West is far from Guilin’s city center (around a 40-minute bus ride by No. 22B, see details below), and it has only two ticket windows for buying or collecting tickets. So, you’d better get your tickets early in hand before your train departs. Which Station: Guilin West vs Guilin North vs Guilin (South)? 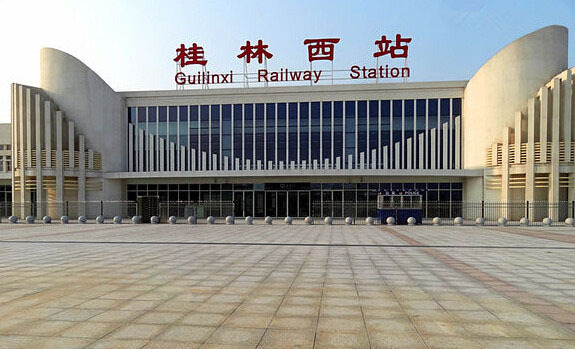 Guilin has three train staion in operation now: Guilin Railway Station (sometimes refered as Guilin South, Guilin Main, or printed as Guilin, 桂林站), Guilin North Railway Station (GuilinBei, 桂林北站), and the newly-built Guilin West Railway Station (GuilinXi, 桂林西站). See the location on Google Map. Guilin Railway Station, located in Xiangshan District, is the most centerally-located in the heart of Guilin City with easy access (by taxi, bus 3, 4, 5, 9, 10, 11, 16, 19, 22, 22b, 25b, 88). Guilin North Railway Station, located in Diecai District, is the second closest from the city center and can be reached by taxi, or bus 1, 32, 100..
Guilin West is the farest one from city center with less public transportation service (bus 303, 22b). So, if you get to choose, Guilin Railway Station (Guilin South or Guilin Main) is the best option for your departure or arrival due to its distance and transport links with city center. Guilin North comes the second, while Guilin West is the worst option. Passengers can take a taxi, public bus to get to Guilin West from Guilin’s downtown. Public bus: No. 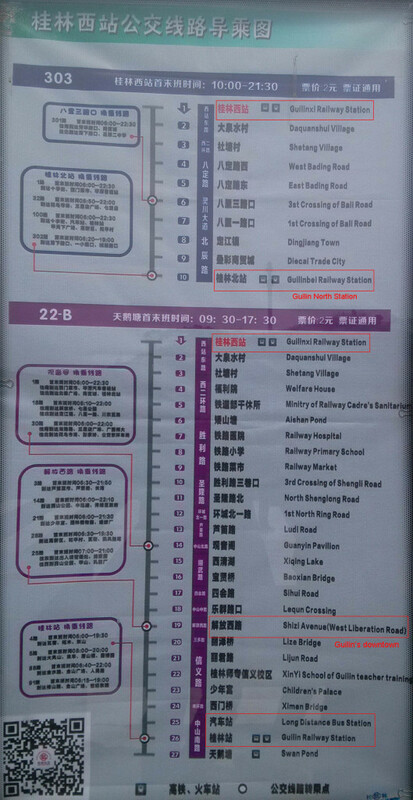 22B (From TianeTang 天鹅塘 to Guilin West 桂林西), No. 303 (From Guilin North 桂林北 – Guilin West 桂林西). Both bus journey cost CNY 2 per person. 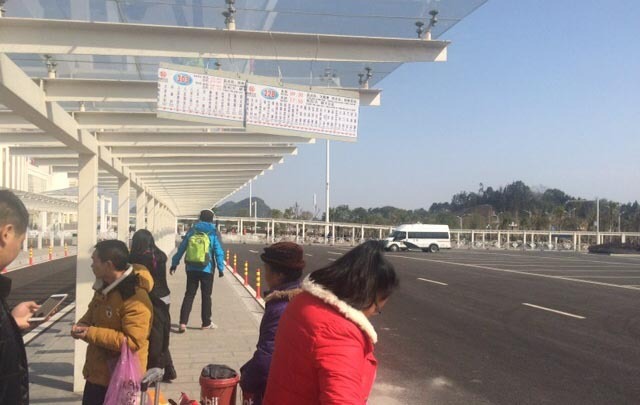 The bus stop at Guilin West for No. 303, 22B bus. By bus: The centerally-located Guilin Main Railway Station (South) is far from Guilin West, around 22 bus stop by No. 22 bus. By train: There are three daily trains running from Guilin West to Guilin Main, taking 30 minutes and costing from CNY 11.5. If it suits your schedule, just catch one to transfer from Guilin West to Guilin South. See train times below. For a live schedule, just use China Highlights by entering Guilinxi and Guilin. Guilin North is both linked with Guilin West by bus and train. You can take the No.303 bus from Guilin West to Guilin North, around 10 stops. It is possible to take a train from Guilin to Yangshuo by train now as the Yangshuo Railway Station‘s opening in 2016. See the Nanning – Guilin – Yangshuo Train page. If the Guilin West Station’s public transport doesn’t sound like the way you would like to go around, China Highlights is based in Guilin and can help. No need to use a travel agent. You can just handle it yourself. Take a bus or use a taxi. Guilin West Station is Guilin s main station for the Guiyang to Guangzhou HSR bullet trains.